The Transit Custom van is built for the city. Delivering a bold new design, the versatility to take on tight streets and the load space to keep your business moving. The Transit Custom also features the latest smart technology with SYNC®3. Enjoy seamless integration so you always stay connected. It’s easy to find the ideal driving position with 4 way adjustable driver’s seat with Lumbar support while the heated seats combat the cold mornings throughout winter with the push of a button. Our next generation SYNC® 3 is a fully integrated, voice-activated system cleverly designed to let you continue working, while your hands stay on the wheel, and your eyes stay on the road. Sync your phone to call your business contacts, listen to music and stay on track with the available integrated Satellite Navigation system. Featuring a customisable 8-inch Colour LCD capacitive Touch Screen, Bluetooth Technology and USB ports, you can easily access all your devices quicker than ever before. Choose how you stay connected by easily switching between SYNC®3 and Apple CarPlay™ or Android Auto™ for seamless integration on the move. We’re passionate about the performance of your vehicle, and your business. That’s why we went further to provide you with the best working partner. From the advanced 2.0L EcoBlue diesel engine and 6 speed automatic transmission, to Driver Assist features like Lane Departure Warning with Driver Alert and Adaptive Cruise control. The Transit Custom can effortlessly carry standard 8’ x 4’ boards flat on the floor or three euro pallets. Thanks to its convenient and innovative load-through storage area, it can also accommodate items up to 3.4m long, without preventing you from using the front passenger seats. 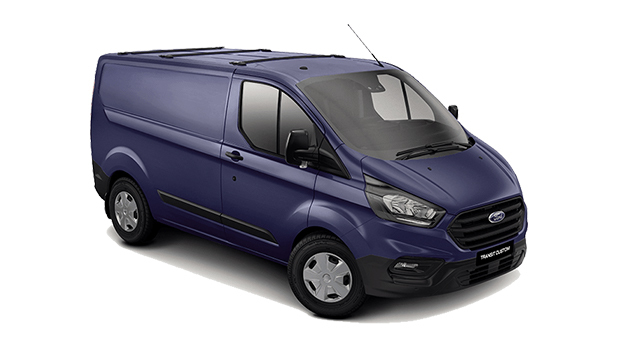 Overall, the van provides up to six cubic metres of loadspace with a bulkhead fitted, and that’s just the short wheelbase version: the long wheelbase offers up to 6.8 cubic metres. Trailer Sway Control detects ‘snaking’ or trailer sway and reduces your vehicle’s speed to help solve the problem, making towing more controlled. The system slows the vehicle down by reducing the engine’s torque and gradually increasing the brake pressure on all wheels. Overseas model shown for illustrative purposes.